In May of 2016 Alex and I visited Crater Lake for the first time. We hadn't done much research so we were surprised to find most of the park was still buried in snow and the entire length of the rim road was not yet open so we were confined to the Rim Village and a few miles of road along the West Rim. We visited over Memorial Day weekend and it seemed thousands of others had the same idea as us as the park was filled to the brim with visitors. To be honest the experience was underwhelming. The park felt overcrowded with people pushing and shoving their way to overlooks and it was a far cry from the wilderness experience I was hoping for. Shortly after that visit I began researching backcountry trips in the park. 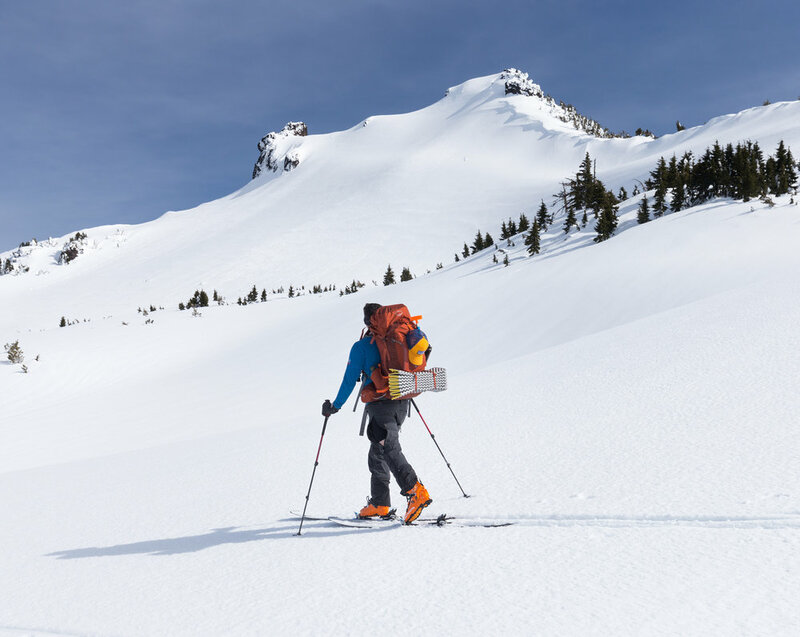 I quickly stumbled across an article about circumnavigating the lake on skis during winter. I immediately cataloged the trip into the recesses of my mind to revisit again in the future. Nearly two years later and I was finally able to entertain the idea of completing the trip. In January I began watching the weather, looking for the 3 day/2 night window necessary to complete the trip. 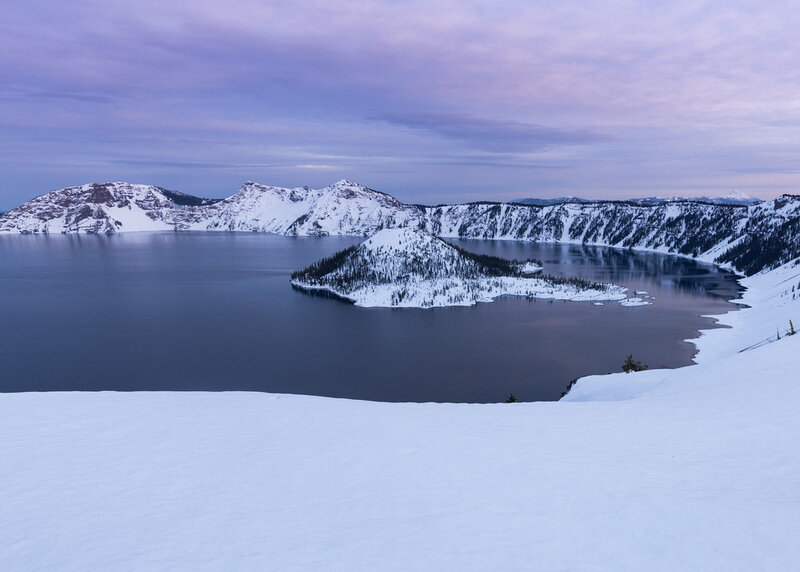 Unfortunately Crater Lake has notoriously bad weather in the winter. Days, even weeks, can go by without storms relenting or the lake appearing out of the flurries of white snow that enshroud it. But I was patient, dutifully checking the weather day in and day out until finally, in Mid-March I checked the ten day forecast and to my surprise saw bright suns staring back at me, nary a cloud in sight. So our circumnavigation date was set. We would spend March 30 to April 1 skinning around the lake using our AT skis. I was so excited I could barely sleep the night before our trip, which was unfortunate because we needed to wake up at 1:30am to begin the seven hour drive to Crater Lake. After what felt like an eternity of driving in the dark we were at the ranger station. Initially we had planned on skiing around the lake counter clockwise. I had read a few online trip reports that recommended doing it that way to get the segment with the fewest lake views out of the way first and end the trip on the scenic West Rim. However, the park ranger convinced us to go clockwise, insisting that it was the easier route so we began the trip by parking at the Steel Visitor Center and then heading up the Raven Trail towards Rim Village. No overnight parking is allowed at Rim Village so this added about a mile and 1000' of elevation gain to our 33 mile round-the-lake trek. It took us nearly an hour to make it to Rim Village, the true starting point of the circumnavigation. This did not bode well for us and I knew it. We had planned to ski about 9 miles on the first day, 12 on the second, and 11 on the third. In order to hit the planned mileage each day I was hoping we would ski at about 2 miles per hour or slightly faster. We were already behind schedule but I remained optimistic. Rim Village was as bustling as it was on our first visit. We made our way through the crowds and over to the West Rim Ski Trail and officially began our trek. After about a mile of skinning we made it to Discovery Point, the point that marks the beginning of the winter camping zone and the end of the road for most day hikers. 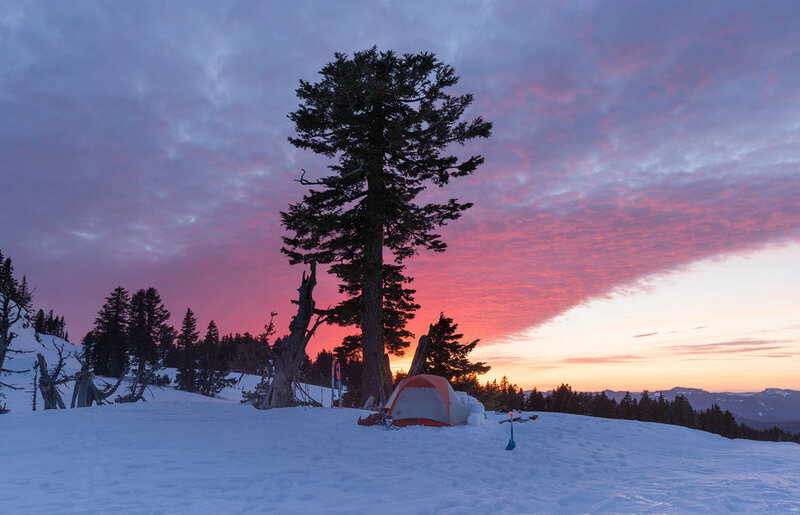 In the summer there is no camping allowed anywhere near the rim but in the winter the entire area reverts back into a wilderness and camping is allowed everywhere except within 100' from the edge of the rim and 100' from roads. We continued to ski along. The sun was now high in the sky and the snow (and we) were cooking. Instead of gliding nicely through the snow our skins were holding firm to the ground and it felt as if we were being pushed back with each effort-laden step. I noted the time again, we were going slower than 2 miles per hour. I could feel hot spots on my feet, the beginnings of blisters, and I tried to shift my feet in my boots ever so slightly to alleviate the pain but to no avail. I picked up the pace. Alex was faring even worse. He was still not 100% recovered from a recent quad injury and was obviously in pain. He made it clear he did not want to continue after the first night and it became evident as the day wore on, that neither of us would be able to make it around the lake in our allotted time. As I realized that this two year dream of mine would not come to fruition I started to beat myself up. You should have worked out more, you should be stronger, why are you giving up so easily? With every step I took I internally berated myself but as time passed (and perhaps as I worked the negativity out of my system) I was a bit nicer to myself. Alex and I were the ones who planned this trip which meant the definition of its success was up to us to decide. I suddenly realized that ticking something off my arbitrary bucket list at whatever cost necessary wasn't what this trip, or any trip for that matter, was supposed to be about. 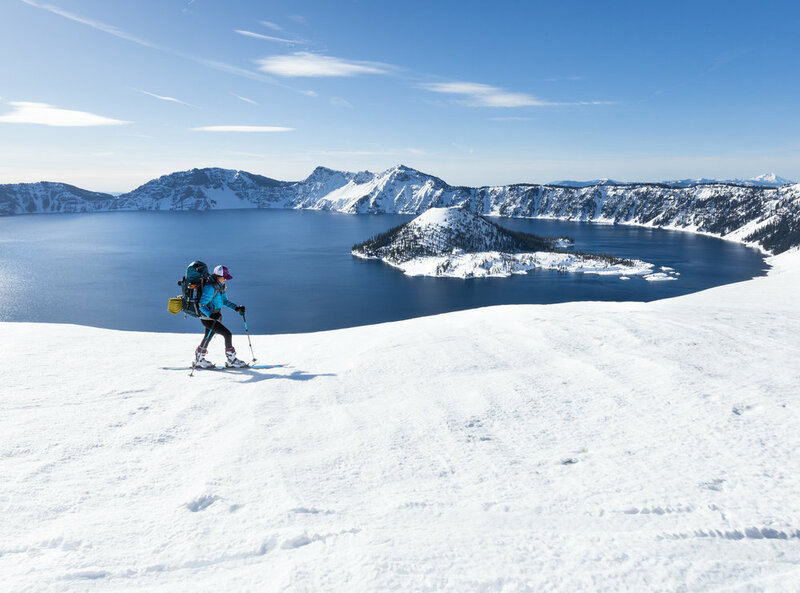 Just being outside, challenging myself, and experiencing the solitude of Crater Lake's backcountry was more than enough to constitute a success. With my newfound mindset I continued on to Merriam Point with a little more pep in my step. After six hours of skinning we made it to our predetermined camp spot. Filled with relief and gratitude I threw my pack down and just soaked in the view around me. The sun was already beginning to sink and the crater was bathed in a warm afternoon glow. By this point it had been hours since we had seen another person but just as I was beginning to boil water for dinner a XC skier cruised up and stopped near us. We asked him if he was completing the circumnavigation and he said he was, with his friend who was on skins and struggling along behind him. As his friend neared us the XC skier whizzed off again, his friend looked defeated as he slowly slogged along on his skins, futilely trying to keep up with his companion. We felt his pain. Watching the stark difference between the XC skier and the AT skier made us rethink our chosen mode of transportation. Where our AT skis and skin combo failed the XC skis excelled. They were noticeably superior on the mushy, sticky snow! As the sun began to set the sky lit up in all directions and Alex and I couldn't figure out which way we should look. The sky over the lake was transitioning into pinks and purples and the sky behind us glowed a fiery orange and red. When we were skiing in I thought we'd set up camp and I'd end up passing out for the night. Instead, the scenery around us rejuvenated me and for a few brief, blissful moments I forgot my blisters and aching legs entirely, too distracted by the beauty. Finally the last bit of light faded from the sky and a chill filled the air. Alex and I retreated to the tent and I proceeded to have one of the best night's of sleep I've ever had while camping. We didn't even wake up to take night photos! The next morning we groggily awoke and peered out of the tent as the first light of day was beginning to creep over the horizon. Reluctantly I dragged myself out of my cozy sleeping bag and put on as many layers as I possibly could before heading out of the tent to make breakfast. After breakfast we took down camp while we watched the sun slowly creep higher in the sky and infiltrate every shadowy nook surrounding the lake. Both Alex and I took way too many photos but it was so hard to put the camera down when every moment the light seemed to shine in a new and more magical way. With all the self-discipline we could muster we tore ourselves away from the scene and began to head back to the car. The snow was still in the shadows and we had a little more glide than the previous night but after a couple hours the snow had turned back to slush and our pace slowed to a crawl again. But finally, finally, we were back at the car and breaking into the snack stash we squirreled away in the glove box before we left. There was no doubt in my mind that we made the right decision when we turned back. This trip wasn't anything like I thought it would be but that's half the fun of adventures - going with the flow and altering plans along the way. The whole trip was a lesson in learning how to view experiences from the right perspective. Had we set out with the intention of camping on the West Rim for a night and heading back we would have considered the trip a smashing success, but since we had our sights set on circumnavigating the whole thing we were left with a feeling of incompleteness. As more time passes I'm inclined to categorize the trip as a success regardless of our original plan and I'm not sure if we'll ever attempt the circumnavigation again. Maybe we will, or maybe we'll just come out for another overnight on the rim. After all, that is a true wilderness experience in and of itself. If you are interested in completing an overnight trip to Crater Lake, please check out my Adventure Guide HERE!